Global markets are in midst of a severe sell off. We are in a terrible bear market, and the question we need to ask – Is this the repeat of bear market of 2000-2002? The answer is may be YES. o It then took 8 months for the market to slide to 200 week moving average. The price correction was 36% and it happened between Feb 2000 and October 2000.
o The market then tumbled below 200 week moving average in March 2001.
o The market sharply tumbled 30% on break below 200 week moving average. o Time Correction – It took 29 months for market to recover once market slipped below 200 week ma. It was a painful slow recovery. 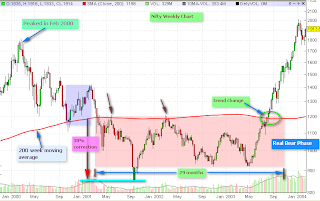 o Every rally below 200 week ma got arrested at 200 week ma during those 29 months of recovery. o The bull market resumed when market finally broke out above 200 week ma in August 2003. Ironically now, a similar story is getting played out in 2008. FYI – 200 week moving average = 3648. This level also coincides with 50% retracement of bull run from 920 to 6300.